So far I've only received a few entries for the Destroying Angels art contest and they look like they were created in Photoshop in about 5 minutes or less. If I don't receive any more entries I will have no choice but to select a winner from these decidedly lukewarm efforts. GET BUSY, ARTISTS! The deadline is September 30th so you still have plenty of time to crank out a winning submission. GOOD LUCK! MF GALLERY has taken their group exhibition I WANT YOUR SKULL on the road! 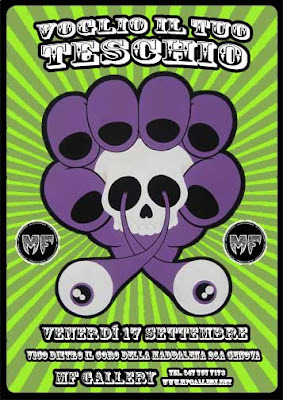 The successful skull-themed exhibit opens this month at their Genova, Italy location! This is exciting news for me because, not only is my drawing being displayed alongside some very talented artists, but this show marks my second international exhibit and first representation in Italy! 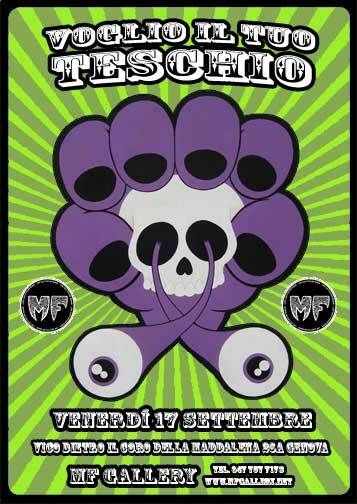 If you live anywhere near Genova, I hope you'll turn out and SUPPORT THE SKULLS! DESTROYING ANGELS #10 SOLD OUT!